Dairying is the largest irrigated industry in northern Victoria, in terms of water used, irrigated area and revenue generated (Meyer 2005). However, irrigation water available to the dairy industry for growing pastures and forages is likely to be reduced in the next 5 years. There is little comparative data available on the water use efficiency of forages for dairy production. These data would be useful to dairy farmers aiming to optimise their forage production under conditions of limited water availability. Maize, as a C4 species, is likely to use water more efficiently than the perennial ryegrass and white clover pastures typically grown for dairy cows in northern Victoria. C4 plants generally have higher growth rates, particularly at high light levels and high temperatures, due to a different leaf anatomy which enables them to increase their carbon dioxide exchange without additional loss of water vapour (Begg and Turner 1976; Stanhill 1986). In southern NSW, the water use efficiency of maize, in terms of dry matter produced from rainfall and irrigation, was estimated to be 34 and 23 kg DM/ha.mm in two years of measurement (Edraki et al. 2003). However, in northern Victoria, only estimates of water use are available. Given the high costs of maize production, more information about the water requirements and water use efficiency of maize is required for confident decision making by farmers. This research was undertaken because maize, as a C4 species, is likely to have a much higher water use efficiency than many other forages suitable for dairying in northern Victoria. 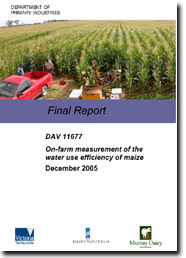 However, there have been no actual measurements made of the water use of maize in this environment (Greenwood 2003). Also, with some farmers irrigating maize using pressurised systems, such as centre pivots, information on the crop’s water requirements in relation to weather conditions would be useful to assist irrigation scheduling.